Fluorescent A3 adenosine receptor antagonist. Displays selectivity for A3 over A2A and A1 (apparent KD values are 8.10, 6.74 and 6.57 respectively). Antagonizes the activity of NECA, an adenosine receptor agonist. Exhibits no intrinsic agonist activity. A fluorescent Xanthine Amine Congener (XAC) analog. For ligand binding; fluorescence imaging; high content analysis; kinetic analysis; cell sorting at adenosine A1 / A2A / A3 receptors use solutions up to 100 nM. 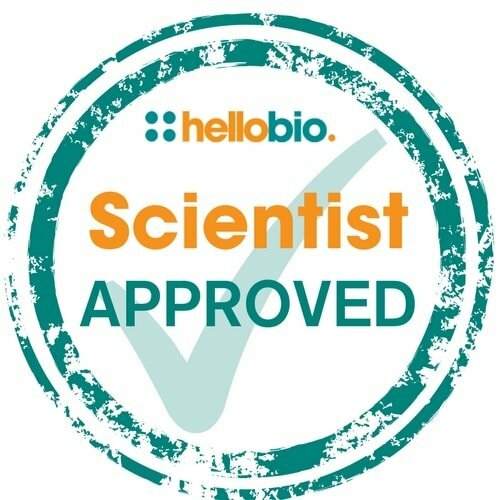 The following papers have cited the use of CA200645 CellAura fluorescent adenosine A3 antagonist [XAC] (HB7812) from Hello Bio. If you have published a paper using this product, and it is not shown here, then please tell us! We will send you a free gift as a thank you! Adenosine-A3 receptors in neutrophil microdomains promote the formation of bacteria-tethering cytonemes. Corriden R et al. (2013) EMBO Rep 14(8) : 726-32. Conversion of a non-selective adenosine receptor antagonist into A3-selective high affinity fluorescent probes using peptide-based linkers. Vernall AJ et al. (2013) Org Biomol Chem 11(34) : 5673-82. 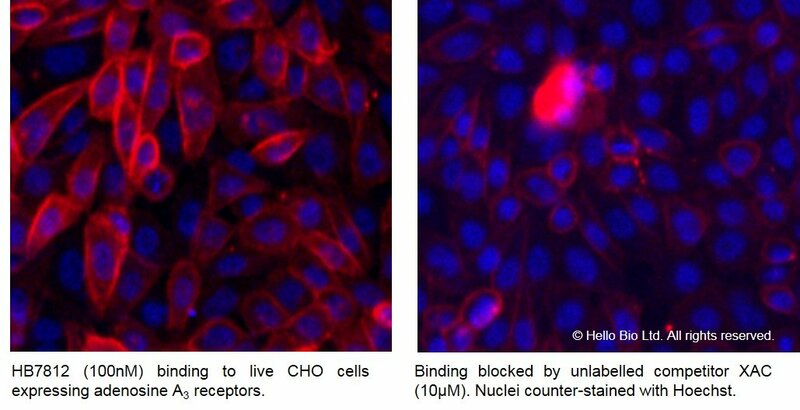 Fragment screening at adenosine-A(3) receptors in living cells using a fluorescence-based binding assay. Stoddart LA et al. (2012) Chem Biol 19(9) : 1105-15.